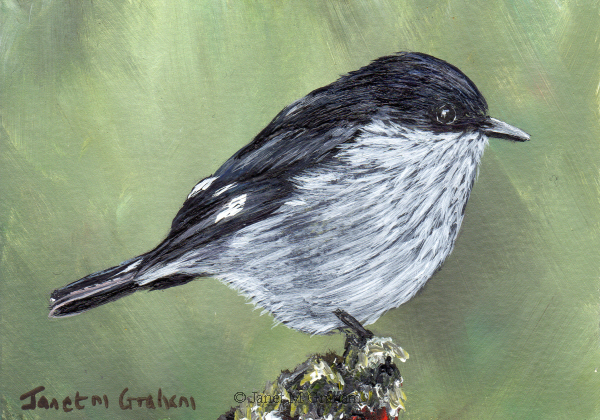 I love painting chickadee's. Love how this one is all puffed up on a cold winters day. 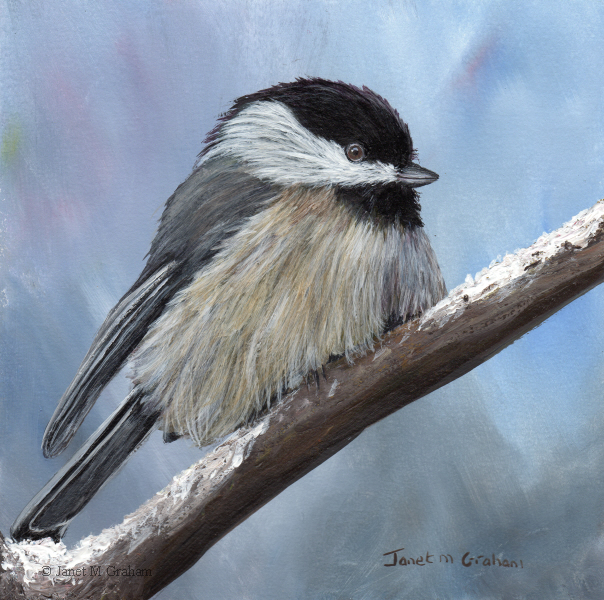 Black Capped Chickadee No 7 measures 6 x 6 inches and is painted on Colourfix Smooth Paper. Really love how this one turned out. Love the play of light against dark. Rufous Tailed Flycathers are found in Jamaica. They measure around 24 cm in length and weigh between 38.6 - 43.2 grams. 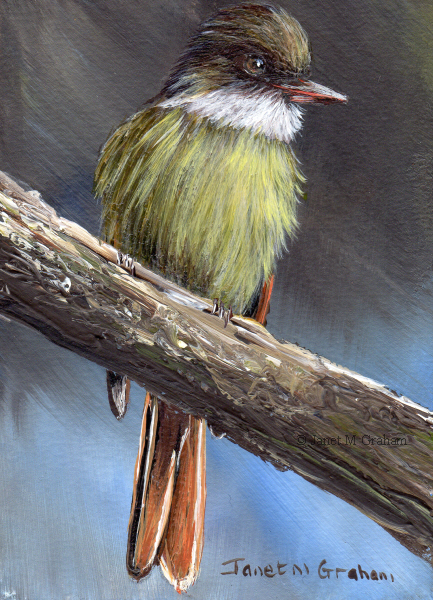 Rufous Tailed Flycatcher measures 2.5 x 3.5 inches and is painted on Colourfix Smooth Paper. Rufous Tailed Hummingbirds are found in Central and South America. They measure between 10 - 12 cm in length and weigh around 5.2 grams. 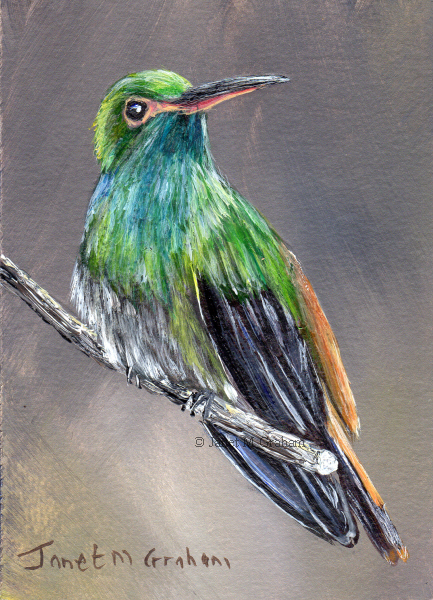 Rufous Tailed Hummingbird measures 2.5 x 3.5 inches and is painted on Colourfix Smooth Paper. And for the second one, I painted this little flycatcher. 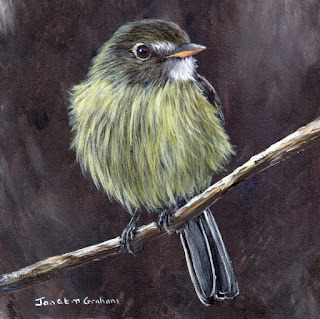 Hammond's Flycatchers are a small flycatcher of Western Northern America. They measures between 12 - 14 cm in length and weigh between 7 - 12 grams. Hammond's Flycatcher measures 2.5 x 3.5 inches and is painted on Colourfix Smooth Paper. Felt like painting yellow feathers this week so this first one - I did quite a few glazes to get the depth to the feathers. 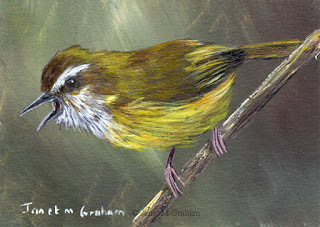 Tickell's Leaf Warblers are found in Asia. They measure 10 - 11 cm in length and weigh around 5.5 7.5 grams. Tickell's Leaf Warbler measures 2.5 x 3.5 inches and is painted on Colourfix Smooth paper. 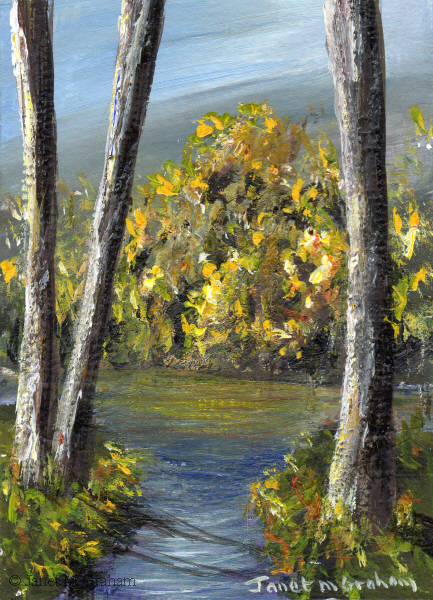 I enjoyed painting these little landscapes. I used a lot of artistic licence as I only use the reference photo to have a rough idea as to where to place the path / stream etc. Both are available for purchase through Ebay. 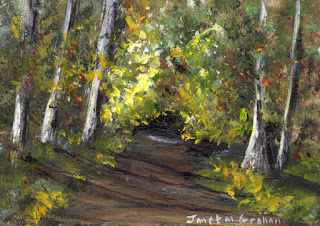 The first on is Fall Pathway ACEO - to view the listing, click here. 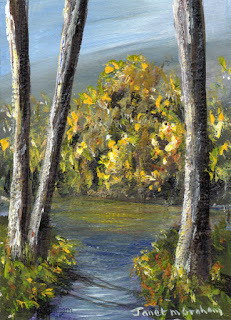 And the second one is Fall Stream ACEO - to view the listing, please click here. This one was rather fun to paint - everything just come together. Tufted Titmouse No 11 measures 7 x 5 inches and is painted on Colourfix Smooth paper. Many thanks to Kelly Strope for the reference photo. 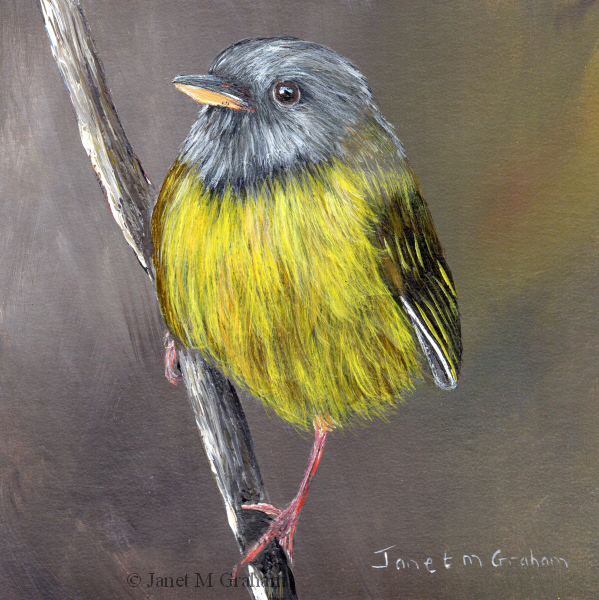 Red Faced Warbler measures 5 x 5 inches and is painted on Colourfix Smooth paper. 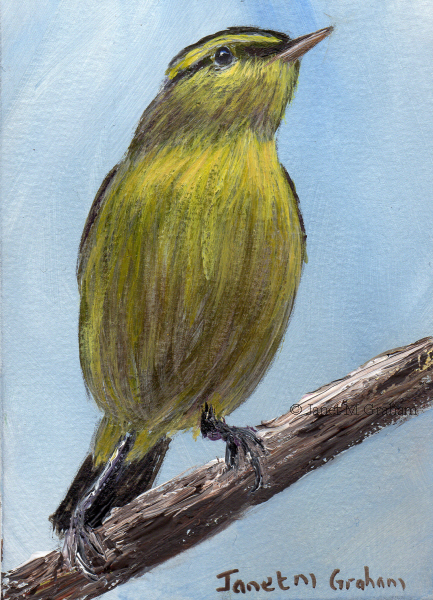 Mourning Warbler measures 5 x 5 inches and is painted on Colourfix Smooth paper. Love the feather colours of this one - really pleased with how it turned out. 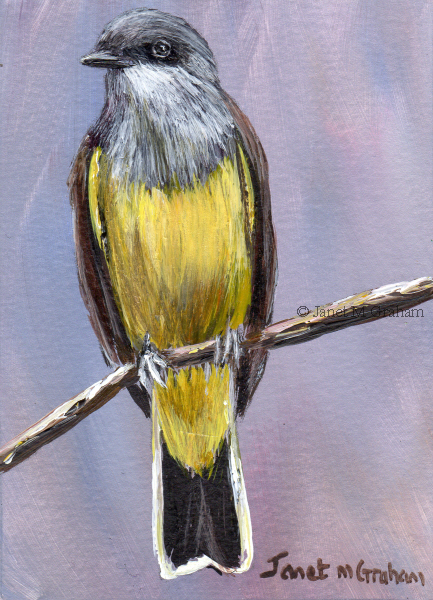 Western Kingbird measures 2.5 x 3.5 inches and is painted on Colourfix Smooth paper. 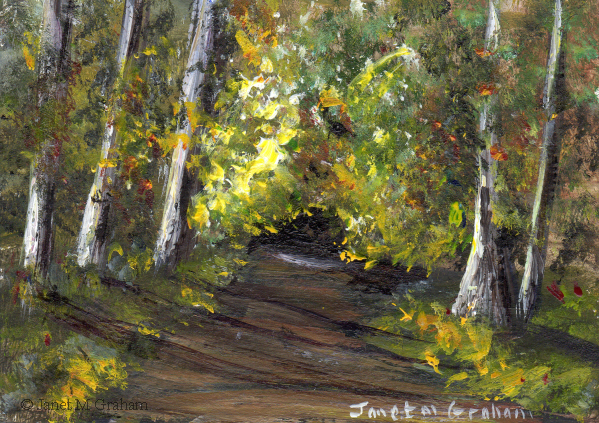 This one was rather fun to paint - everything just seemed to work. Did quite a few glazes to get the depth to the feathers. 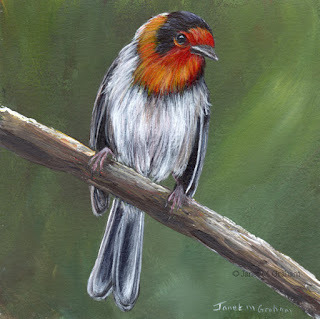 Fiscal Flycatchers are found in South Africa, Botswana, Lesotho, Mozambique and Swaziland. They measure around 17 - 20 cm in length. Fiscal Flycatcher measures 3.5 x 2.5 inches and is painted on Colourfix Smooth paper. Love how this ones feathers are all fluffed up. Really please with how it turned out. Dusky Flycatcher measures 5 x 5 inches and is painted on Colourfix Smooth Paper. The painting is available for purchase through my Etsy Shop. To view the listing, please click here. 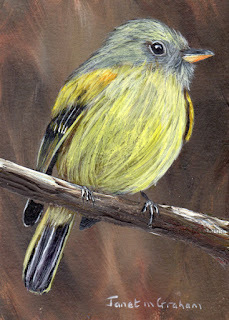 I love how this one is perched on the branch. 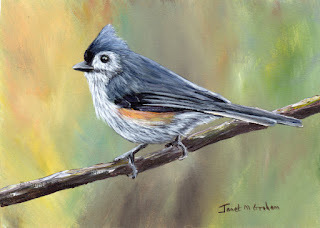 It was a bit more tricky to paint due to the different angle it is perched on the branch but I was up for the challenge. Red Billed Leiothrix are native to China and the Himalayas. They were introduced to quite a few countries including Hawaiian Islands in 1918. They measure around 14 - 15 cm in length and weigh between 18 - 28 grams. They are known by quite a few names including Pekin Robin, Pekin Nightingale, Japanese Nightingale and Japanese Robin. 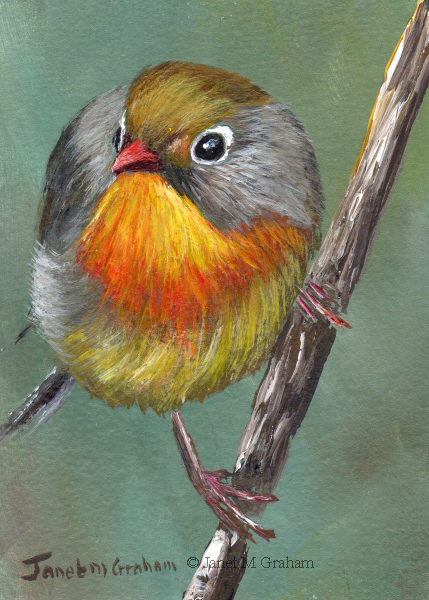 Red Billed Leiothrix measures 2.5 x 3.5 inches and is painted on Colourfix Smooth Paper. 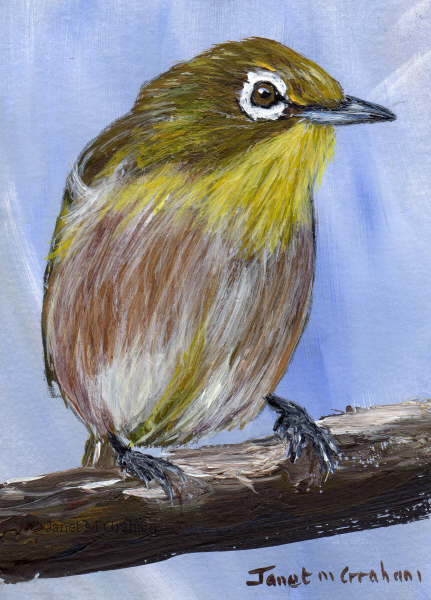 The Japanese White Eye is also known as the Mejiro and its native range includes much of east Asia. It was introduce to Hawaii in 1929. They measure around 10 - 11.5 cm in length and weigh between 7.5 - 13.9 grams. 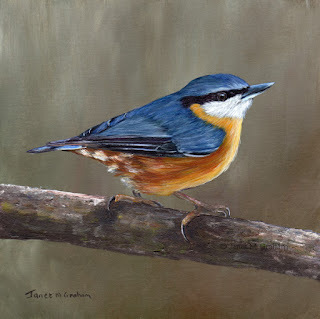 Nuthatches are one of my favourite birds to paint. I have quite a few favourites 😊. Nuthatch No 3 measures 8 x 8 inches and is painted on Colourfix Smooth Paper. I love how this one is perched on the branch chirping away. Yellow Bellied Warblers are found in Bangladesh, Bhutan, Brunei, Cambodia, China, India, Indonesia, Laos, Malaysia, Myanmar, Nepal, Thailand and Vietnam. They measure around 9 cm in length and weigh between 6 - 7 grams. I love the markings of this one. 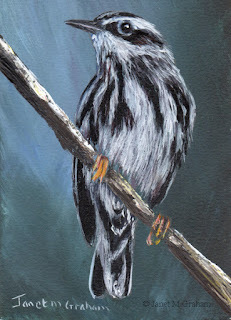 Black and White Warblers breed in Northern and eastern North America and winter in Florida, Central America and the West Indies down to Peru. They measure between 11 - 13 cm in length and weigh between 8 - 15 grams. Black and White Warbler measures 2.5 x 3.5 inches and is painted on Colourfix Smooth Paper.